FREE PMI importer? Catia, Creo, NX & Solidworks! Catia, creo, nx & Solidworks! I have sold, trained and supported PC based 3D CAD to Boeing and virtually all of their suppliers in the Greater Seattle area for over 30 years. In the early 2000’s Boeing moved from Catia 2/3/4 (12 years) to Catia 5 (But not to Catia 6?). I will not get into the fiasco this caused, but one thing that happened was that Dassault provided a PLM system that Boeing now based their complete engineering system. This included MBE (Model Based Enterprise) delivered as a native Catia 5 file in the form of PMI (Product Manufacturing Information). Which could be only called a 3D drawing. All of the dimensions and annotation was in 3D space as shown above. My Boeing suppliers were shocked. Boeing did not prepare them for this incredible paradigm shift. Boeing eliminated the AID (Associated Information Document) or what the Boeing Draftsman called the flatfile (drawing) and delivered the part and additional information in the PMI format. So what was the problem? Well, the suppliers had to have a current seat of Catia 5 or Enovia to view it. It could not be delivered as a print since it was in 3D. Most of the suppliers were not willing to fork out the big bucks. At the same time Adobe released Acrobat 3D. It could read and display the PMI and included the part in a STEP format. For some reason it didn’t catch on and Adobe quit offering it. I think it had to do with the integrity of the 3D model, I suppose the 3D model being used as the engineering authority can make engineering a bit nervous, especially with Catia 5 putting out some of the most corrupt models in the industry. Can the 3D Model Be Used as the Design Authority? ZW3D is a dream come true for the supplier that has to work with many different companies with different CAD systems. You can import the PMI and start working with it for your tooling or upgrade to the integrated CNC products. With its multi-object environment and integrated drawing you can keep your project in one file. Imagine that! I do it all the time. PMI has been a standard engineering deliverable for all of the large companies that can afford the convoluted MBE system for almost 20 years. Yet, there has never been a standard "free" PMI viewer available. Well, we almost have a free solution!! 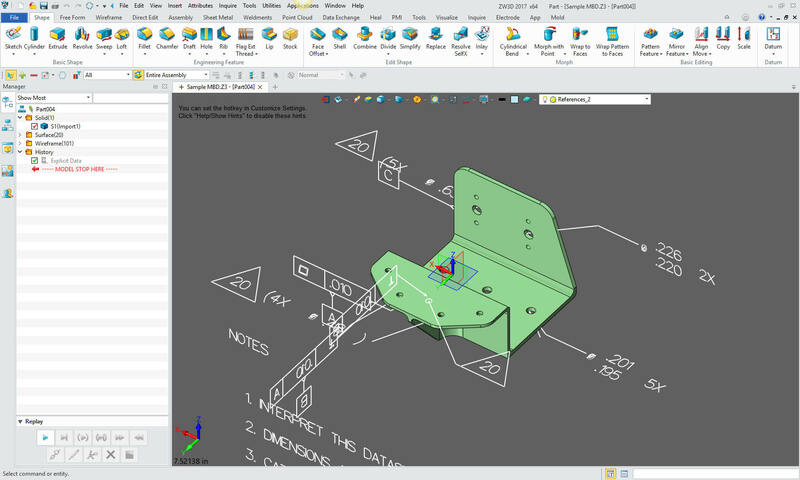 ZW3D can now import Catia 5, Creo, NX & Solidworks native PMI files! It also imports Solid Edge and Inventor native files. It imports and exports all of the neutral formats plus Catia 4/5! Up until now you had to have a seat of the native CAD system, a native viewer or buy an expensive translator to just view the PMI. Yes, ZW3D can now read the PMI. But, not only do you have the PMI to view but the model itself is directly available for tooling or any other purpose in ZW3D or you can easily export it to your current CAD or CAM system. Try it for yourselves. download a 30 day fully functional evaluation copy! For more information or to download ZW3D! It is now included it in all of ZW3D products. Below is an example of a Catia 5 file with PMI. Feel free to give us a call if you have any questions, would like a demonstration or would like to put in an order directly. We only service the USA and Canada! The Case for Inexpensive 3D CAD! We know you spend thousands for your CAD systems and support. What's a couple of hundred to see if you can effectively cut those costs and quit working for a huge CAD corporation. We can help! Complete Professional 3D CAD system with both history base and direct editing solid modeling and compete documentation functionality. The is the best value adding Sheet Metal Design, Robust Class A Surfacing and Reverse Engineering to ZW3D Lite. 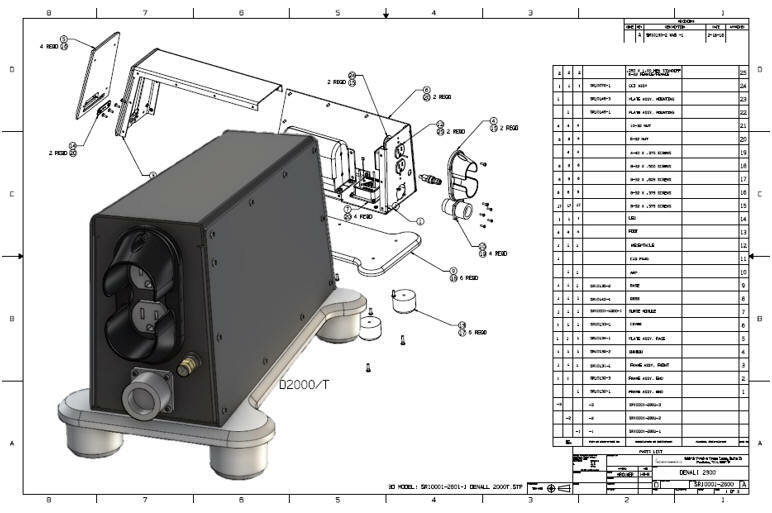 For other ZW3D manufacturing and integrated CAD/CAM solutions please follow the link below. The Case for Inexpensive Integrated 3D CAD/CAM!